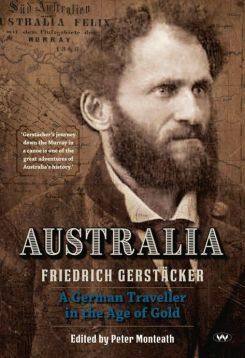 For the first time Wakefield Press has released an edited English version of German travel writer Friedrich Gerstäcker’s ‘Australien’ (1854). Peter Monteath is a lecturer at Flinders University and was the man behind the project. In our interview he talks about the relevance of Gerstäcker’s accounts today and why his adventures still make for an intriguing read. Translating and editing ‘Australia’ by Friedrich Gerstäcker seems like a big undertaking. How did you come across this book and what made you want to take on this project? South Australians have known for a long time that Friedrich Gerstäcker traveled here. But it was a very vague kind of memory. So when we wanted to find out in more detail what he did when he was here we looked for sources and found out that there once was this entire book dedicated to Australia amongst the series of travel books that he published in the 1860s. There was a book by him in English called ‘Narrative of a Journey Round the World’ and there is a section in that book on Australia. But his German book is devoted at much greater length to his Australian adventures. Yes, it sounds like the original ‘Australien’ is six times as long as the book you just mentioned. So were you the one who initiated the project of translating this longer work of Gerstäcker into English? It was my idea but I knew from the start that I couldn’t do it entirely by myself. In particular Lois Zweck from the Friends of Lutheran Archives here in Adelaide certainly knew quite a lot about Gerstäcker and was aware that the book existed. She was very supportive of this idea that it should be translated, because it would be a great source for historians and others who are interested in the German presence in South Australia in particular, but didn’t have access to the book because it was available only in German. There seems to be quite a bit of ancestry research happening online - in Australia, the USA and other countries he traveled to - where people use his travel accounts to trace back family lineage. Do you think this is still something of interest when it comes to your new edition of ‘Australia’, especially in the Adelaide, Barossa Valley region? Yes, there was someone who came to one of my presentations and she said she was keen to find out whether one or two forebears were mentioned in the book. She was very happy then because she found when she read the book that this forebear, by the name Noltenius from Bremen, was mentioned. One of the things that Gerstäcker was keen to do was take up contact with these Germans who had settled in South Australia, but also in New South Wales. So he meets up with Germans in Sydney. He goes up to Newcastle and around that area. And he’s very keen to find out - that’s really the main purpose of his trip - how these German settlers are coping in various parts of the world. Before he was in Australia he was in South America and met up with Germans there. Then he was in California. He traveled across the Pacific. He went on to Java from Australia. And in all of those cases what he wanted to do was make contact with the settlers and find out how they were coping - whether they regretted leaving Germany, whether they had made decent lives for themselves. That’s what he wants to report on. Just in the first chapter of the book Friedrich Gerstäcker writes about one of those observations: ‘No matter how passionately people are attached to their own country, they still want to see a different one, so that they can think longingly back to their own.’ I think anyone who has ever traveled or lived abroad for a prolonged period of time will be able to relate to that statement in a certain way. I think that’s true. He’s certainly someone who is very attracted to the exotic. So he is driven as a young man to leave Germany. And he imagines that he himself will be an immigrant and probably make his life in the United States. So on the one hand he loves the exotic, he loves travel, he loves distant countries, but on the other he’s also gratified when he travels and finds these little pieces of Germany that he comes across when he’s in faraway countries, whether it’s Brazil, Argentina or Australia. Some of Gerstäcker’s accounts would be seen as controversial these days, especially in the chapter on ‘Native Australians’. A couple of the sentences are quite offensive, especially when it comes to his descriptions of the appearance of indigenous people. But then he makes quite logical observations about why they wouldn’t have hunting bows, of their natural environment. How did you, as a historian, look at that material? It was a difficult issue to come to terms with. We took the view that Gerstäcker is understandably a man of his time and that he holds many of the views that were very common at that time, and he uses the language that was common then and which we find strange and confronting now. We thought we couldn’t avoid that issue and had to present it as it was. But I think the interesting thing in his case is that he holds a lot of prejudices before he comes to Australia, and even when he is in Sydney he’s given accounts of indigenous Australians by people who hold all sorts of fears and anxieties and prejudices themselves and they pass them on to him. So they warn him if he’s going to travel overland to South Australia, then he needs to be very cautious, because there are dangers out there. He is informed that what he’s planning to do is full of peril. Of course he tells his story with this sense of not only adventure, but drama. He plays on that, because he’s trying to make a living from his writing. But then, as you indicated before, what tends to happen is that when he himself comes into contact with indigenous people, he learns more about the circumstances in which they live, and he appreciates the challenges that they face in their lives. After all, they are the ones who often had to adjust in very painful ways to the arrival of Europeans. So in the end, although he might have commenced his adventures in Australia with certain prejudices, he comes and experiences it further and develops a level of sympathy. There are some humorous parts in the book. Would you agree with that? Yes, he is a writer who finds comedy in a lot of situations. He writes about a lot of particular experiences, includes anecdotes. He looks for humor wherever he can find it. Many people who don’t come from a German background might find that a bit surprising. I think that’s a prejudice against Germans sometimes. Germans can be humorous, and he certainly brings that good dose of humor into the way he writes about his experiences. For people who might not be overly interested in historical writing or don’t come from a German-Australian background: Why would you say this book could speak to them nonetheless? What makes this a good read? I think it comes back to that idea that he’s not writing a scholarly work. On the one hand he’s writing to educate. So he no doubt had in mind that there are lots of Germans back in Germany who want to know if Australia is the sort of place that would be worth emigrating to. He wants to inform them. But as a professional writer he also wants to sell a lot of books and therefore writes in an entertaining way. That’s why he builds in these moments of suspense, of drama, but also of comedy, and it’s why the narrative moves at a fast pace. He doesn’t dwell on any topic. So his intent is not just to inform, but to entertain, and I think that comes across. He’s got a nice balance there. Thank you for the interview Peter! Friedrich Gerstäcker: was born in Hamburg in 1816. Inspired by the writing of Daniel Defoe he set off for America in 1837 intending to become a farmer, and sent his mother a diary of his adventures. He returned to Germany in 1843 to discover that his mother had been publishing his stories in a periodical to great popularity, and so his career as a bestselling writer began. During his adventurous life Friedrich Gerstäcker would travel to the Americas, Tahiti, Indonesia, Egypt, and Australia. His trips were funded by a fruitful relationship with his publisher, and his considerable output was devoured by a legion of devoted readers, making Gerstäcker a household name for many years. Friedrich Gerstäcker died in 1872, suffering from a stroke while preparing for a trip to Asia. 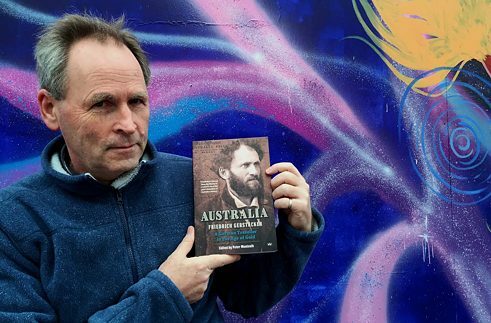 Peter Monteath: is a Fellow of the Alexander von Humboldt Foundation and teaches History in the School of International Studies at Flinders University, Adelaide. His recent books include POW: Australian Prisoners of War in Hitler’s Reich, Red Professor: The Cold War Life of Fred Rose (with Valerie Munt); Interned: Torrens Island 1914-1915 (with Mandy Paul and Rebecca Martin), and the edited collection Germans: Travellers, Settlers and their Descendants in South Australia.